Following a request from a very worried client in Brighton our fully qualified Property Care Association (PCA) damp and timber surveyor attended the property to carry out a thorough damp and timber survey in the basement of the property. 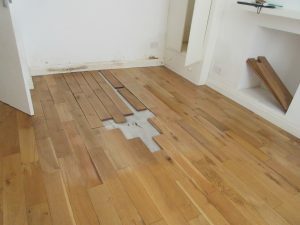 It was found that the majority of the walls were dry-lined and the floors, which appeared to be reasonably new hardwood were seriously bowing and lifting. We were advised that the whole basement had daily recently been damp proofed but the contractors were denying and responsibility. On our clients instructions, small areas of the dry lining was removed to expose a studded membrane system which had not been installed correctly. Readings taken with a calibrated moisture meter and a thermal imaging camera revealed very high levels of moisture to large areas of walls and floors. A detailed report together with images, a floor plan and or recommendations was forwarded to our client for her consideration. Tapco HomeDry’s Damp Proofing and Cavity Drain Membrane Systems (CDM) are covered by our 20 Year Guarantee and are protected by Guarantee Protection Insurance (GPI). Unlike our client, do it once, do it right. We are long term members of the Property Care Association (PCA) the Basement Waterproofing Association(BWA) and Trust Mark (Government Endorsed Standards). Call us first.